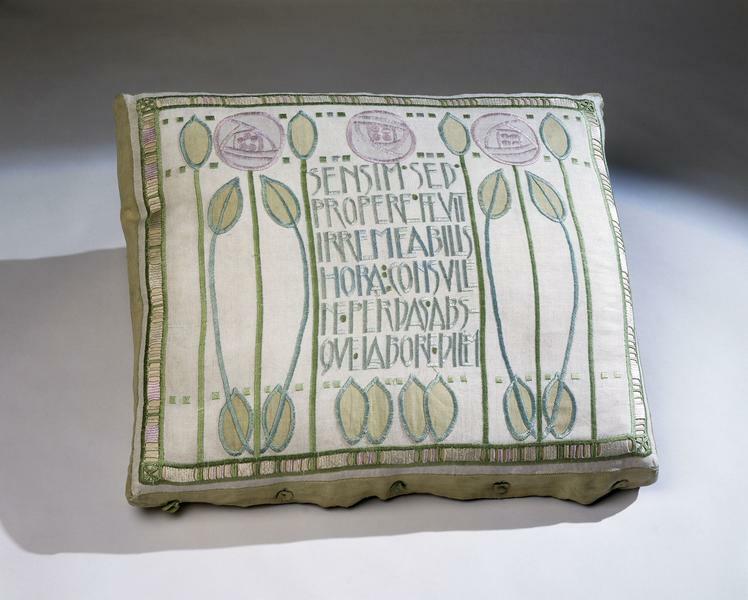 This cushion cover was described by Jessie Newbery's daughter, one of the donors, as being 'for ordinary use'. It is now recognised as one of the most characteristic works of Jessie Newbery (1864-1948), the main exponent of the Glasgow School style. 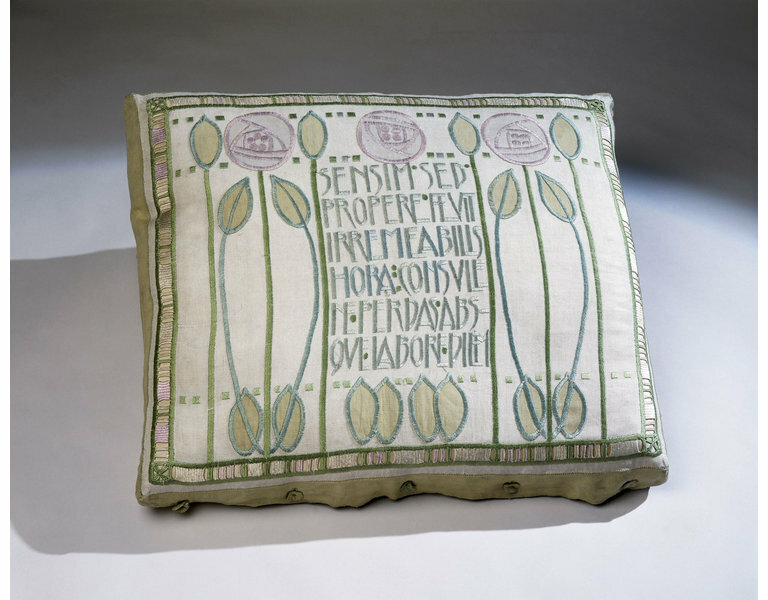 In 1894 Jessie Newbery became head of the embroidery department at the Glasgow School of Art. Her teaching was revolutionary. She believed in the importance of form and structure over superficial decoration and encouraged the use of simple, speedy techniques, particularly appliqué, to provide fresh, intuitive effects. She taught to a wide range of students and her Saturday morning classes were organised for primary and secondary teachers and professionals. With the administrative separation of the Glasgow School from English control in 1899 the School had much greater control over its own work which helped encourage a strong, individual style. Newbery encouraged the use of linens and unusual techniques such as needle weaving (used in the borders of this piece). The inscription and the stylised roses which form part of the design are both characteristics of her work and ones that were widely copied. Newbery's simple satin stitch lent itself to the linear patterns and inscriptions for which she is now famous. It also provide the most straightforward means of securing applied motifs. 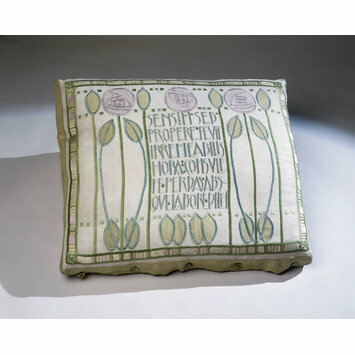 Cushion cover of embroidered linen with silks. With a cream linen ground with a design of stylised flowers and leaves and small geometric ornament. In the centre is an embroidered inscription. The flowers are appliqued in linen and in shades of green and pink silk, and with a border of needle-weaving in green, cream and pink silks on drawn threads, and an outer border of green linen. Inscribed with a Latin poem in the centre, which remarks upon the passage of time and encourages daily work.